I love to organize. In fact, there was a time in my life that I thought I might hang out my shingle as a professional organizer. I came to organizing at an early age, it was not uncommon for me, even as a child, to go to my cousin's houses and clean their rooms, even if they weren't home. I have to admit that my house can get a bit messy/dirty at times, especially now that I have kids and am always on the go, but it's nothing that a couple of hours of picking up, vacuuming, dusting and floor washing won't fix. I went through an organizing book reading binge and here is a compilation of suggestions that I took away from the many books on the subject. Does it have a current or specifically planned future use? Does it have value to me - sentimental, monetary or aesthetic? Would it be difficult or expensive to replace? Is it taking up space that could be better used? Keep like with like. (All your Christmas stuff should be together, all your craft supplies, linens in one place, etc.) Once you 've grouped all your like items together, you can see what you have and decide what to keep. Make sure that the most commonly used items are the most accessible. Keep items in the the room they are used in. The only exception to this is cleaning supplies, obviously keep all cleaning solutions out of reach of children. Make a master "Action Item" list of jobs that need doing or repairs to be made. Understand that the value of an item may have changed over time. Just because it was important to you at some previous point, doesn't mean that you have to keep it if it no longer has the same value. I also find it helpful to limit the rooms my children are allowed to have toys/books in to two rooms - their bedrooms and the playroom. In your house it may be a playroom and living room, or bedrooms and basement, etc. Whatever works for your family. Generally it works to have a room on each floor. I find that this makes it easier and faster to clean up and prevents people from hurting themselves by stepping on stuff left all over the house. Do I want it badly enough to care for it? Am I prepared to get rid of something I already own in order to make room for it? Where exactly will I put it? Try not to be overwhelmed, just pick a room or project and get to work! I've included the cleaning schedule that I've developed for myself over the years. It is very specific to my home and family, but can be modified to suit your family's needs. I also like a flowchart that I pinned on Pinterest that I feel includes most of the important tasks to maintain a clean and comfortable home. Use a scouring powder to clean kitchen sink - baking soda & dish soap works great. Clean bathroom: sink & countertop, toilet, bathtub & surround, mirror (I'm a firm believer in using bleach cleaners for bathrooms, just wear gloves & make sure to have the room well ventilated). Sort through kids clothes - mine go to one of three places: garage sale box, rubbermaid container marked by size for next kid, or if the youngest has outgrown it and I love it too much to part with it, it goes into a rubbermaid storage container of clothes I'm saving to give to them when they have their own kids. Sort through kids toys - outgrown toys go to garage sale box or storage for their kids. Disinfect light switches & door knobs (especially if someone in the family is sick). Every couple of weeks I do a "deep clean" of the kids bedrooms & playroom where I go through all their stuff, throw out the broken toys and random paper junk they've collected and sort the rest back into their proper places. I would love to hear your cleaning and organizing tips, please leave them in the comments section below. 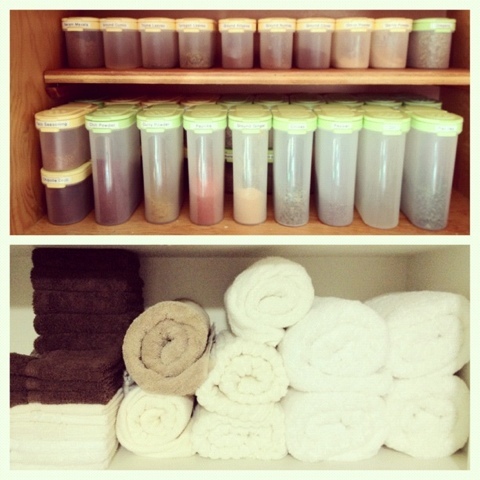 I wish I was that organized....& work towards that...& in some areas I am!!! :) A work in progress...slowly! !